Shrimp Cakes are juicy and flavorful, spiked with fresh dill, lemon, and smoked paprika, and served with the most amazing mayo-based dipping sauce. The cakes are the perfect finger food that the whole family will love! When it comes to shrimp, our family is a huge fan of them. We eat a lot of shrimp dishes, and Shrimp Cakes is easily one of the top dishes we enjoy the most. If you are a huge shrimp fan like us, check out the Spicy Garlic Shrimp. This recipe is so tasty especially when you dip in some crusty, warm bread in it. Similarly, we recently made these Bacon Wrapped Shrimp and they were a huge success. 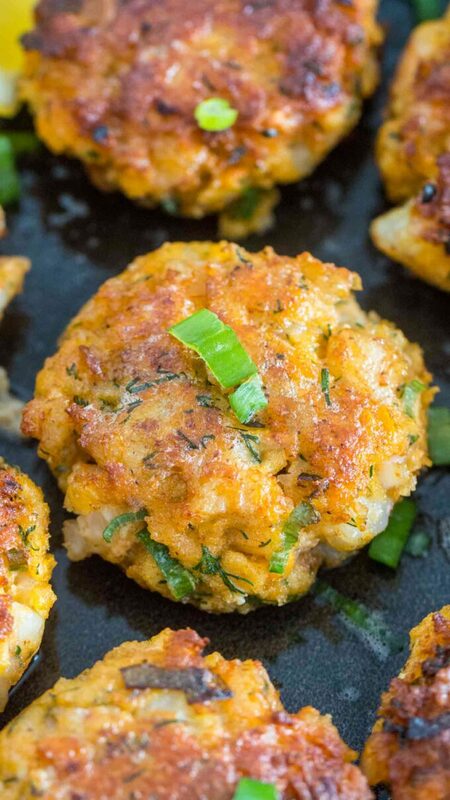 Shrimp Cakes are very similar to crab cakes, but also a lot cheaper to make. 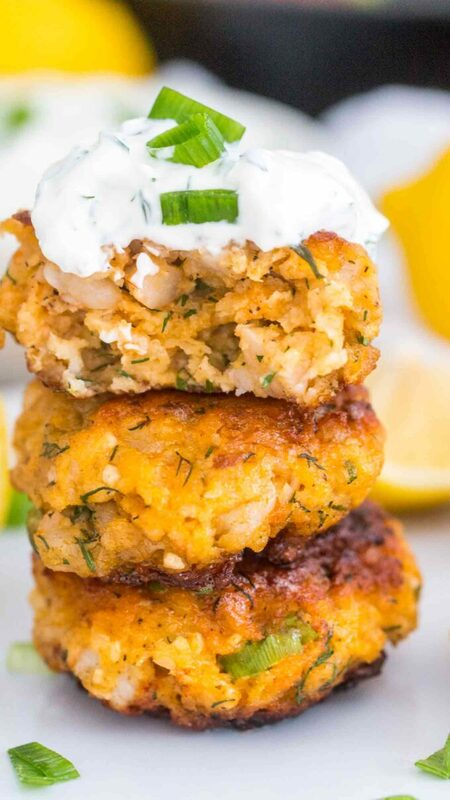 Similarly, we like them more because they tend to be juicier and more versatile than traditional crab cakes. You can mix them with your favorite ingredients, or veggies, so the mix and match possibilities are endless. If you are a cheese lover, you can add some cheese into the mix. Also, if you enjoy a spicier kick, just add some jalapeño. Whichever mix you prefer, they are guaranteed to be a huge hit. 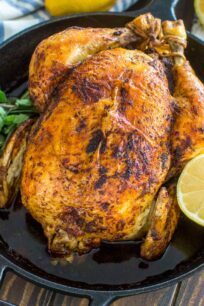 They always come out juicy, tender and very flavorful! These Shrimp Cakes have long been one of our favorite dinner dishes to make for a few reasons. First, they are very easy and timely to make, and also a cheaper alternative compared to what you pay at a restaurant. The shrimp are cut and mixed with all the fresh ingredients, like fresh lemon juice, fresh dill, and green onion, and then combined together into cakes. Served with a dill mayo-based dipping sauce or salad, they are guaranteed to make your family and guests happy! HOW LONG DO YOU COOK SHRIMP CAKES IN THE OVEN? For this recipe, we cooked the Shrimp Cakes on the skillet, for a crispier texture. Alternatively, you can bake the Shrimp Cakes in a 400F preheated oven, for about 15 to 20 minutes or until the cakes are crisp around the edges and shrimp turn pink. Can I use a food processor to chop the shrimp meat? We prefer to cut the shrimp by knife in proportional sizes because we like to feel the larger shrimp bites in the cakes. However, using the food processor will finely chop raw shrimp meat uniformly. It will work great as well, but make sure not to over process your shrimp – you want small chunks, but you don’t want to grind it into a paste. What kind of wine pairs well with Shrimp Cakes? White wine usually pairs well when cooking shrimp or any other Seafood dish. Sauvignon Blanc or Chardonnay would be ideal wines to use for shrimp. This is your go-to category. If possible, choose a wine that has a moderate alcohol content, preferably between 10 and 13 percent, and generous acidity. Use quality shrimp. Preferable wild-caught shrimp whenever possible. Similarly, avoid farm-raised shrimp, because they might be raised with antibiotics and could lead to health problems. Wash the shrimp really well and dry them with a paper towel before cutting. Also, use fresh lemon juice as it will give a fresher and nicer flavor to the dish. If you like garlic, add some freshly minced to the mixed. Use an ice cream scoop to make the ball portion of shrimp cakes. 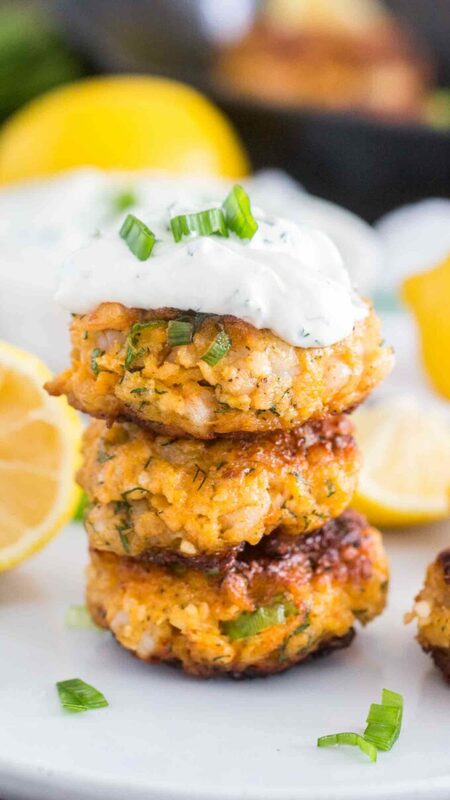 Shrimp Cakes are juicy and flavorful, spiked with fresh dill, lemon and smoked paprika, and served with the most amazing mayo based dipping sauce. Using a sharp knife, cut the shrimp into small cubed like pieces. 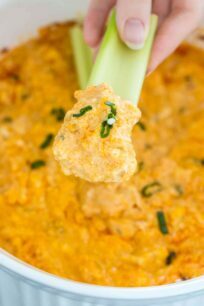 Transfer the shrimp to a large bowl and add the remaining of the ingredients: panko bread crumbs, beaten egg, hot sauce, green onion, dill, lemon juice, lemon zest, paprika, onion powder and salt. Stir gently to combine. Form the shrimp mixture into 8-10 patties. You can use an ice cream scoop to make each sized portion. Next, heat the oil in a large pan over medium-high heat. Once the oil is hot, add the shrimp patties in a single layer and cook for about 3-5 minutes on each side or until golden brown. Gently flip on the other side, to not break the patties. Mix all the sauce ingredients in a small bowl until fully combined. Serve with the shrimp cakes with lemon wedges on the side. These were really good. As suggested I used less mayo, added a little old bay and patted on panko crumbs. Stayed together perfect and had a wonderful delicate taste. Thank you! Loved your recipe!! Oh wow these look amazing!!! 🙂 But seriously, that crust – has me DROOLING! I’m such a seafood lover and I’ve had crab cakes and salmon cakes but I’ve never had shrimp cakes. I need to make these soon. I know my husband will like them too. The dipping sauce sounds good too. My entire family would love this! I love that they’re easy to make. I would have to make about 3 dozen to make it to our family! You had me at shrimp, which we all love. My son will eat shrimp all day if we could afford it. These cakes look great and I have to try to make them for the boy. My family is huge fans of shrimp. I know they would love this recipe. Looking forward to making it for them. 30 mins? Wow! I need to make these for the hubby he would love them. I’ve NEVER had shrimp cakes. Which is saying a lot because I love seafood and shrimp is my fave. 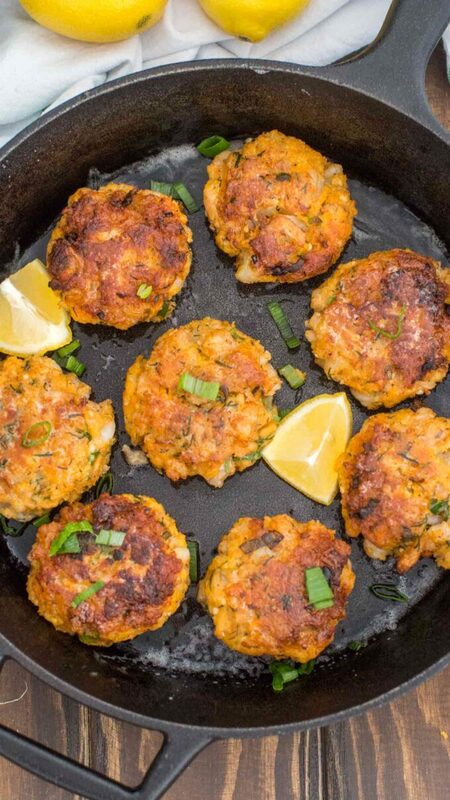 I have a few tried and true crab cake recipes but I may just have to try out this recipe. 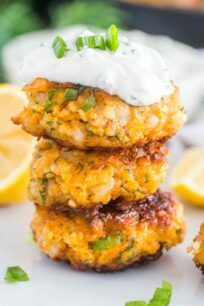 I have made crab and salmon cakes but never shrimp ones. 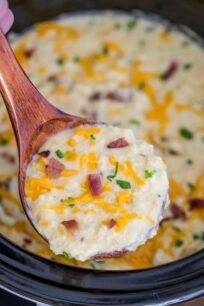 Yours look delicious–I need to try this recipe! I know my kids would love these. They are all about shrimp! This would be a tasty dinner. These look really good. I have had crab cakes and fish cakes but I have never had shrimp cakes. This looks so yummy! My mom makes her own version but this recipe is another must-try. Love that there are veggies in the mix. YUM! I am printing this one out and trying it this week! I bet they are delicious. I am sure he will enjoy these! I am not a fan of shrimp but the rest of my family loves it. I can’t wait to try to make these for them. You should make these for them they will love it! Oh yum, I’ve never tried shrimp cakes before. I’ve had crab cakes which are pretty good, but I may need to try these soon. thats the best way to enjoy these! I’ve made crab cakes and salmon cakes, but never would have thought to make shrimp cakes. Interesting. These look pretty tasty! I’d probably use a food processor to chop up the shrimp though because I’m not sure how I’d feel about the meat chunks. Hmmm.. Definitely gotta try these. You can use a food processor, just make sure you don’t make them into a paste.